Overgrown meadows and fields require more than a strimmer and a lot of patience. They need a proper clearing-machine that won't stall, stutter or stop working when confronted with extra-heavy loads. Enter the Billy Goat BC2600ICM Mower. 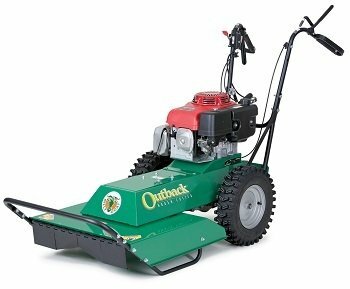 This machine is designed specifically for tackling out-of-control areas; slicing effortlessly through brush, weeds, nettles and saplings. It has a 66cm clearing-path, with a rugged steel deck to take on tough terrain. The cutting-deck sports a heavy-duty blade spindle, reinforced on four sides to tackle tough vegetation including thick brush up to 1.8m high; or brambles, bush and weeds over 2.5m tall. It can even cope with saplings up to 5cm in diameter. There's a heavy-duty mechanical transaxle that features three speeds (plus reverse); and which combines the transmission and differential into one sealed package, so nothing can snag during use. Both forward- and reverse-controls are ergonomically placed at the fingertips of the operator for superior manoeuvrability. The wide motorbike-style handles are comfortable to use; padded for added comfort; well positioned; and feature hand-guards for protection. The 40cm wheels feature rugged, puncture-resistant tyres. This item comes with a full one-year warranty.